The Pflueger SUPSP30 features is the only magnesium spinning reel in the marketplace at this price point and it packed full of high-end features. Its aluminum handle, and aluminum bail wire is extremely strong and corrosion resistant providing years of quality performance. The Pflueger SUPSP30 has a braid ready spool allowing anglers to skip the backing and hold more line. Its super-lightweight magnesium body and rotor, braid ready aluminum spool, and sealed carbon fiber drag make this a great choie in lightweight performance and makes it perfect for either freshwater or inshore fishing. The Pflueger SUPSP35 features is the only magnesium spinning reel in the marketplace at this price point and it packed full of high-end features. Its aluminum handle, and aluminum bail wire is extremely strong and corrosion resistant providing years of quality performance. The Pflueger SUPSP35 has a braid ready spool allowing anglers to skip the backing and hold more line. Its super-lightweight magnesium body and rotor, braid ready aluminum spool, and sealed carbon fiber drag make this a great choie in lightweight performance and makes it perfect for either freshwater or inshore fishing. The Pflueger SUPSP40 features is the only magnesium spinning reel in the marketplace at this price point and it packed full of high-end features. Its aluminum handle, and aluminum bail wire is extremely strong and corrosion resistant providing years of quality performance. The Pflueger SUPSP40 has a braid ready spool allowing anglers to skip the backing and hold more line. Its super-lightweight magnesium body and rotor, braid ready aluminum spool, and sealed carbon fiber drag make this a great choie in lightweight performance and makes it perfect for either freshwater or inshore fishing. The Pfluger Supreme XT SP25X spinning reel is lightweight and has outstanding durability. The reel utilizes a magnesium body, rotors and sideplates that are all protected by a proprietary process. This 3 step process provides excellent corrosion resistancce and outstanding durability. The Pfluger Supreme XT SP25X is made with a titanium main shaft, carbon handle with an EVA knob, aircraft grade aluminum skeletonized spool, sealed carbon drag system and durable titanium-coated line roller. The results, a spinning reel that has great durability but is considerably lighter than its competition. The Pfluger Supreme XT SP30X spinning reel is lightweight and has outstanding durability. The reel utilizes a magnesium body, rotors and sideplates that are all protected by a proprietary process. This 3 step process provides excellent corrosion resistancce and outstanding durability. The Pfluger Supreme XT SP30X is made with a titanium main shaft, carbon handle with an EVA knob, aircraft grade aluminum skeletonized spool, sealed carbon drag system and durable titanium-coated line roller. The results, a spinning reel that has great durability but is considerably lighter than its competition. The Pfluger Supreme XT SP35X spinning reel is lightweight and has outstanding durability. The reel utilizes a magnesium body, rotors and sideplates that are all protected by a proprietary process. This 3 step process provides excellent corrosion resistancce and outstanding durability. The Pfluger Supreme XT SP35X is made with a titanium main shaft, carbon handle with an EVA knob, aircraft grade aluminum skeletonized spool, sealed carbon drag system and durable titanium-coated line roller. The results, a spinning reel that has great durability but is considerably lighter than its competition. The Pfluger Supreme XT SP40X spinning reel is lightweight and has outstanding durability. The reel utilizes a magnesium body, rotors and sideplates that are all protected by a proprietary process. This 3 step process provides excellent corrosion resistancce and outstanding durability. The Pfluger Supreme XT SP40X is made with a titanium main shaft, carbon handle with an EVA knob, aircraft grade aluminum skeletonized spool, sealed carbon drag system and durable titanium-coated line roller. The results, a spinning reel that has great durability but is considerably lighter than its competition. Built for extreme performance and years of dependable use, the Canyon DJR6500 is super smooth with a 1 year warranty. The 11 bearing system and drag system are encased in a fully sealed body that makes this reel 100% waterproof. 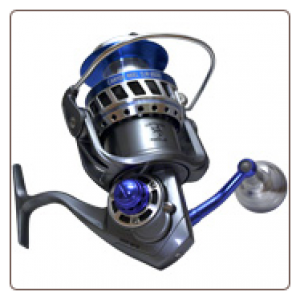 The aluminum body, rotor and ball arm assembly, stainless steel gears and machined handle and spool all add up to a dependable reel that will last. This reel is titanium and Ocean Blue in color and has a port to lubricate the gear box.